Hello Writers! Welcome to the first Tuesday Slice of Life Story Challenge in July. Summer is a wonderful time to begin something new. If you’re joining us for the first time, here are some FAQs from our Slice of Life info page. If you are a veteran Slicer, welcome back, we are thrilled you are here. Start a blog. Blogger and WordPress are easy to navigate and have great step-by-step directions when getting started. 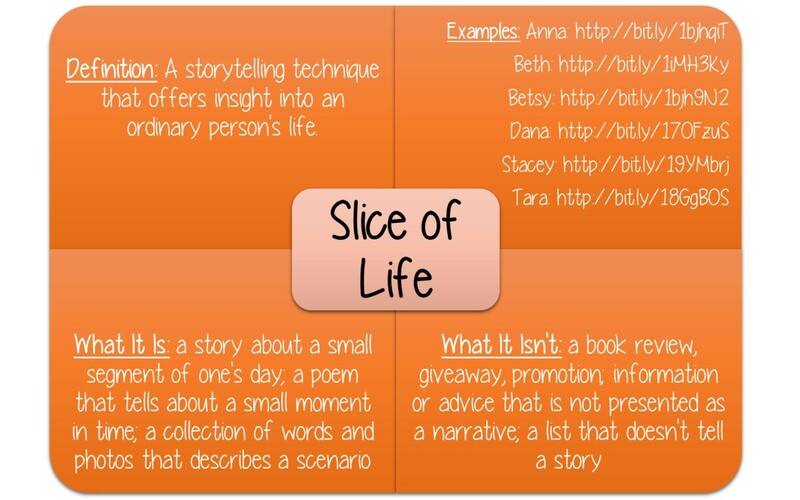 Write and post a Slice on your blog. A Slice is a little segment of your day. Copy the unique URL (this is the link that goes directly to your blog post, not just a link to your blog). 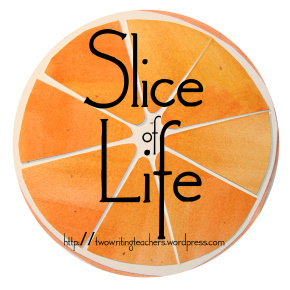 Visit the Two Writing Teachers “Call for Slices” post on Tuesday. Read and comment on at least three other Slicers’ posts. Late, late, late, but I go to go to nErDcampMI! Trying to blog and post by phone. Oy! Not tech savvy. Anyway a post about me and my guy. This is summer–I wrote my blog yesterday and revised it today trying to make sense of my slice. Inspiration for my post: Jon Gordon’s blog about finishing with a bang. My post is about going from a closing that fizzles to one that is a finale. I am interested in your take away and in what you do to leave a lasting impression each day: https://meanderingmaya.wordpress.com/2015/07/06/from-a-fizzle-to-a-finale/. I enjoyed some childhood memories, triggered by a friend’s question. My notes from being in Mary Ehreworth’s Adv Reading Section at TCRWP. What a section!! Julie, your link didn’t show up! Since I’m a tech-newbie, I don’t know how to fix it. Sorry! OOPS! Wrong reply person! Sorry! Your link didn’t show up tonight! A little something about fireflies and the wonder of nature. Stress can make you sick! An interesting character on the plane made for some good reflections. It is true, you can find what you need on the internet. Here is one example. I am in the creation mode these days and so I offer Morning Musings: http://beyondliteracylink.blogspot.com/2015/07/morning-musings.html. Have you visited a Little Free Library? I found 5 in my town. I haven’t had a ticket in several years now, guess it was time…. I am totally “off-topic” from my usual blogging about preschool. I’ve been doing some personal research about the four young black girls who died in the church bombing in Birmingham, Alabama in the 1960s…I wrote three poems. Lessons learned from saying goodbye..
What I think summer will be like and what summer is really like at home with two five year olds …. both still have reading moments! Good to be writing again even if it still gives me a headache. What advice would you give to young teachers in making? Here is the first of a few summary blog entries about my week at TCRWP July Reading Institute, a transformative week of learning. I start with my notes taken during Lucy’s Keynote. Are you a writer? A silly question in this community. Or is it? Mystery solved . . . and I move from grumpy to glad! Restorative practices and summertime. Celebrating my 150th post! Celebrating a special 4th of July…for so many reasons!